Boom! The U.S. and its allies struck Syria in response to a suspected deadly chemical attack several days ago. Gold should be the safe haven in such situations, right? 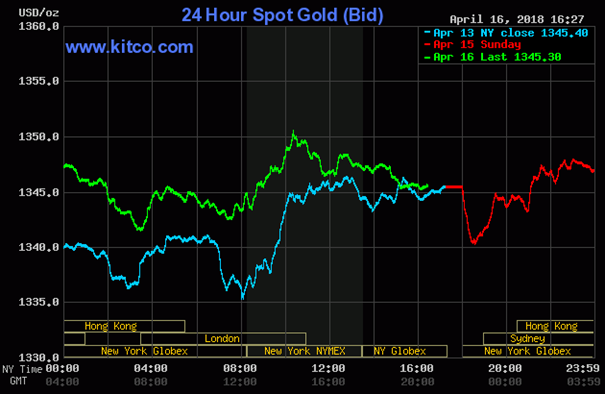 But the price of gold was practically unchanged on Monday. What happened? A lot has happened in recent days. Luckily, we have kept an eye on the most important developments for you, so let’s analyze their potential impact for the gold market. First of all, Syria is again on the investors’ radar. Or actually on the military’s radar – on Friday, the U.S. lead allies – France and the UK – and launched a missile attack on Syria for an alleged chemical weapon attack on a town near Damascus on April 7. It was probably the most significant attack against President Bashar al-Assad’s government by Western powers in seven years of Syria’s civil war, so investors worried about the repercussions. Some analysts even argued that Syria was a serious threat for a world and that the rising tensions in the Middle East would be bullish for gold. Well, we were skeptical about this interpretation. We always repeated that geopolitical threats provide only temporary support for gold prices, at best. And indeed, U.S. futures rose yesterday, while gold prices remained practically unchanged, as one can see in the chart below. Chart 1: Gold prices from April 13 to April 16, 2018. Why didn’t the airstrikes move gold? And why would they? You see, as we always emphasize, the markets are driven by expectations and often buy the rumor and sell the fact. Gold smells war. Indeed, the wave of strikes on Syria was priced in last week – and it is why the price of gold didn’t rally yesterday. Moreover, some military strategists point out that strikes were very precisely conducted, with no Russian targets hit. It is a rather good sign that the Western powers do not want an escalation of the conflict. So gold may not even have the opportunity to shine as a safe-haven, actually. In the long run, macroeconomics trumps geopolitics. So what has recently changed in the macroeconomic outlook? Well, on Monday, the Commerce Department published the report on March retail sales. They rose 0.6 percent last month, following s 0.1 percent decline in February. The rebound was expected, but the actual number beat expectations. The recovery will not help the first quarter too much, but it suggests that the U.S. expansion will continue. Which is not good news for the gold market – moderate economic growth could keep the yellow metal within a relatively narrow trading range. Inflation is looming on the horizon. We know that it may sound strange, given that the CPI fell 0.1 percent in March. But the yearly rate of inflation actually rose from 2.2 percent to 2.4 percent, hitting a one-year high. And what is most important: core CPI, which excludes volatile energy and food prices, advanced 0.2 percent in March. On an annual basis, core inflation climbed from 1.8 percent to 2.1 percent, the highest level in more than a year. What does it mean for the gold market? Well, higher inflation could finally boost gold, which is considered to be an inflation hedge. On the other hand, the rise in prices is not likely to blast off into space. And if it accelerates, the Fed could raise interest rates more aggressively, which could actually exert downward pressure on gold prices. War will break out in the Middle East. Buy gold. North Korea will bomb New York. Buy gold. Trade conflicts will lead China to sell all American securities. Buy gold. The apocalypse is coming. Buy gold. Have you heard such opinions? We have. For years. None of these prophecies have come true. It’s not surprising as these “analyses” are not based on facts, but on the investors’ fears and sales techniques. But we don’t sell gold. We provide accurate research for investors on true gold drivers. Geopolitical risks have little impact on the precious metals market. Macroeconomic factors are much more important. The implication is that the current renewal of the Syrian conflict shouldn’t significantly affect gold prices. The continued economic expansion with rising inflation will likely be more important, as well as the changes in the U.S. dollar’s strength. So stay calm and avoid the sowers of fear! If you enjoyed the above analysis, we invite you to check out our other services. We analyze thoroughly the impact of geopolitical threats on the gold market in our monthly Market Overview reports and we provide daily Gold & Silver Trading Alerts with clear buy and sell signals. If you’re not ready to subscribe yet and are not on our gold mailing list yet, we urge you to sign up. It’s free and if you don’t like it, you can easily unsubscribe. Sign up today.